I just want to give you the heads up on a Tula Pink Charm Swap going on right now. You can sign up on Flickr HERE. After making my I heart scraps basket I have fallen in love with Tula Pink fabrics. It's funny how sometimes I really don't like a fabric or designer until I get the fabric in my hands and actually use it. Then I fall head over heals for it! (Same thing happened with my Liberty bundle. Now that I've put it into something I am geeking out about how awesome it is, and how well the prints go together. Man, I'm a dork.) :) Sewing and quilting is definitely a whole new avenue of exploring and learning... a medium all it's own. The more I sew and quilt, the more I realize how little I know about it. (as in perfecting color combinations, etc.) I love it! Ok, so anyway, I am definitely excited for this one. And since I decided that I really need to know what I'm going to do with it, so it's not just sitting on my shelf, I decided to use it for my Starry Skyline Quilt. I have been wanting to turn the tutorial for the one block into a complete pattern for well over a year now. So this is it! I'm going to do it... sometime soon. :) But figuring out the fabric is the first step right?! Starry Skyline Block. Find the tutorial HERE. 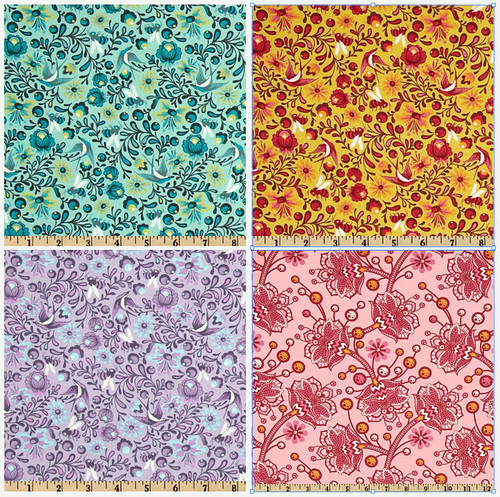 Kate Spain Blog Hop and a Post Full of Goodies! End of the Year + Teacher Gifts!